Nearly all of the biomes on Earth are dictated by two factors: the amount of temperature and precipitation they receive, and these are correlated. Temperature on Earth is dependent on the solar angle of incidence, or the angle at which the light waves from the sun hit the surface of the earth. Areas of earth that are perpendicular to the sun’s rays receive more energy than other parts where the sun’s rays hit the earth at an oblique angle. Over one year, the equator receives the most amount of light energy from the sun per area; whereas the poles receive the least. At the middle latitudes there is a moderate angle of incoming light, creating moderate temperature. Solar angle of incidence is the primary determinant of global temperature patterns. Figure 1. Global variations in temperature are due to variations in the solar angle of incidence. Figure 2. Variation in terrestrial average solar radiation is a function of latitude and elevation. Figure 3. Average ocean temperatures decrease with increasing latitudes due to variation in the solar angle of incidence. Figure 4. Global averages of atmospheric water vapor, which correlates with average global temperature. The light intensity from the sun is maximized directly at the equator. This causes equatorial air masses to warm. On Earth, the warmer the air mass, the higher its water holding capacity, and therefore the more moisture (gaseous water) it can hold. Thus, air masses at equatorial regions can hold more moisture than cooler latitudes. In addition, as air masses warm they expand causing warm air to have a lower density than cool air. Consequently, warm air rises. At the equator, the direct solar angle of incidence warms the air mass increasing its water holding capacity and decreasing its density. However, as the air mass rises to higher altitudes, it begins to cool. As the air mass cools, its water holding capacity decreases which causes the gaseous water to condense into liquid, in effect causing rain. This is why the tropical forests of the world are so lush. They have the most sunlight and the most water of any other place on Earth. Figure 5. 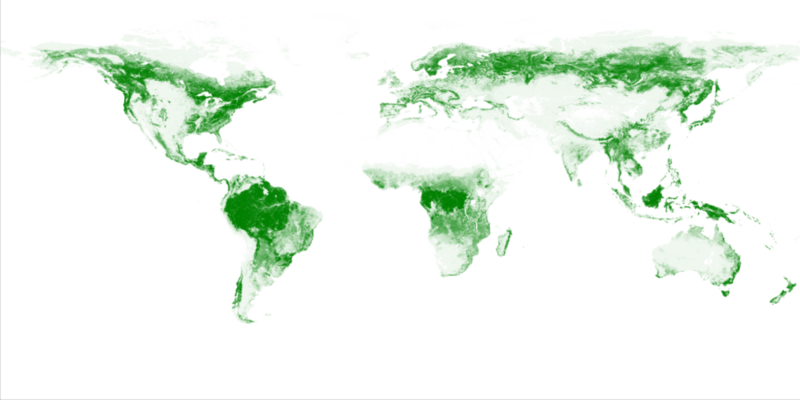 Global tree cover is determined by precipitation patterns. Differences in solar radiation, due to variations in the solar angle of incidence, are the driving force of atmospheric circulation, the rotation of air masses within Earth’s troposphere. Two atmospheric circulations occur between 30˚N and 30˚S, known as the northern and southern Hadley Cells. Solar radiation is on-average greatest at the equator, which induces air masses to warm due to greater heat absorption relative to higher latitudes. As the equatorial air mass warms, its density decreases causing the air mass to rise. Warmer air mass also increases its gaseous water (vapor) holding capacity. As equatorial air masses rise in altitude, temperatures decline. With falling temperatures, the water holding capacity decreases condensing gaseous water into liquid causing precipitation. In effect, equatorial regions of Earth generate their own rain. As the rising air mass cools, it also becomes more dense, increasing air pressure. Even though higher altitudinal air masses are more dense at the equator, they continue to rise due to the incoming warm air below. This phenomenon, creates an area of low air pressure close to Earth at the equator. The air mass eventually reaches the top of the troposphere, at boundary known as the tropopause, and moves poleward. As the air masses move north and south from the equator, water continues to condense eventually forming precipitation. Eventually, no more gaseous water remains in the air mass halting precipitation as the air mass moves. At approximately 30˚N and 30˚S, the air mass begins to sink due to increasing air density, creating an area of high pressure at the Earth’s surface. The discrepancy between the high pressure at 30˚ and the equator causes the air mass to flow toward the equator, essentially propelling the convection of the Hadley atmospheric cells. As the air mass falls, it warms. However, nearly all the moisture has been removed from the air mass. These hot, dry areas caused by the Hadley Cell convection phenomenon produce the world’s great deserts. The Sahara Desert (Africa), the Sonoran and Mohave (US), and the Australian outback are all oriented at 30˚ latitude. In each hemisphere there are three atmospheric convections: the Hadley cell (from 0˚-30˚), the Ferrell cell (from 30˚-60˚), and the Polar cell (from 60˚-90˚). Figure 6. Global convection cells. At 30˚, the warm, extremely dry air mass descends from the tropopause earthward generating high air pressure. As this pressurized air mass reaches the surface of the earth, it travels both toward the equator (closing the Hadley cell convection) and poleward (beginning the Ferrell cell convection). As the air mass moves toward the poles from 30˚, it begins to warm due to the higher temperatures at lower latitudes. As the air mass warms, it absorbs water vapor due the increased water holding capacity of the warmer air. As the air mass reaches the 60˚ parallel, the density of the air mass decreases causing the air to rise (akin to the process at 0˚), creating an area of low air pressure. As the air rises, temperatures decline dropping the water holding capacity of the air mass, forming precipitation. This is the cause of the world’s very cold, wet taiga forests (i.e. Southern Canada, Northern Europe, and Russia and Northern China) where coniferous trees dominate. As the air reaches the tropopause, it either moves back toward the equator or toward the poles. As the air mass moves away from 60˚ the air mass continues to cool releasing precipitation. This phenomenon provides rain and snow creating the cool, wet temperate forests of Northern United States, Southern Europe, and China. These forests typically are dominated by deciduous trees Similar to the Hadley cell though, once the water has completely precipitated, the air mass becomes dry. As the Ferrell cells travel towards 30˚ just below the tropopause, the temperatures continue to decline increasing the density of the air mass, causing the air mass to descend back to Earth at 30˚, completing the Ferrell cell. The Polar cell (60˚-90˚) convection shares many similarities with the Hadley cell. Though dry and cool relative to the equator, the air mass at 60˚ has enough thermal energy to rise driving the Polar and Ferrell cells. Once the air mass reaches the tropopause at 60˚, it moves both poleward and towards the equator. In the Polar cell, the air mass moves towards the poles cooling and releasing precipitation as snow or rain. As the convection reaches the poles it descends as a cold, dry high-pressure air mass. Very little precipitation falls at extreme latitudes due to this phenomenon. Areas of the poles that are not dominated by glaciers in extreme northern and southern latitudes have minimal moisture availability and an extremely short growing season, and are inhabited by very short scrubby vegetation in a biome known as the tundra. Ultimately, differences in solar radiation determines global positioning of biomes. On average, solar radiation is greatest at the equator and lowest at the poles. While precipitation on average correlates with temperature, variability between temperature and precipitation is due to atmospheric convection of the Hadley, Ferrell and Polar cells. Figure 6. The Coriolis Effect. In the inertial frame of reference (upper part of the picture), the black ball moves in a straight line. However, the observer (red dot) who is standing in the rotating/non-inertial frame of reference (lower part of the picture) sees the object as following a curved path due to the Coriolis and centrifugal forces present in this frame. Every 24 hours the Earth completes one rotation around its axis. With the North pole oriented at top, the Earth rotates counter-clockwise on its axis. This causes air masses moving toward the equator to deflect towards the right (in the northern hemisphere) and toward the left (in the southern hemisphere). Imagine a rocket being propelled directly south from the north pole. If the Earth were not rotating, the rocket would be propelled directly toward the equator. However, since the Earth is rotating the rocket will not directly reach the equator perpendicular to its original trajectory. As the Earth spins, a rocket moving from the north pole towards the equator will bend to the right. This phenomenon is know as the Coriolis Effect. However, unlike the simplification of the Coriolis Effect in Figure 4, the convection of air masses on Earth make this process more dynamic and complex. Strange at it may seem, different latitudes rotate at different velocities. The circumference of the Earth at the equator (40,000km) is much larger than the circumference at the pole (effectively 0km).Therefore, the surface of Earth at the equator is moving approximately 1,666 km/h while directly at the pole the earth is effectively moving close to 0 km/h. This variation in rotational rates at the surface of Earth are responsible for global wind patterns. This phenomenon causes terrestrial wind patterns in the northern hemisphere to move towards the right (relative to their initial trajectory) and wind patterns to move left in the southern hemisphere. Figure 7. Global wind patterns are a function of atmospheric convection patterns and the Coriolis effect. As the warm air mass reaches the surface of the Earth at 30˚, the flow spits moving both poleward and towards the equator. As the air mass of the Hadley cell moves back towards the poles, the Earth is spinning counterclockwise. Due to the variation in the Earth’s circumferential rotation rates, wind moving towards the equator is moving slower than the Earth’s surface. This phenomenon causes air masses moving toward the equator to simultaneously flow clockwise (to the right in the northern hemisphere and to the left in the southern hemisphere, relative to the initial velocity) from 30˚ to 0˚. This effect creates the Earth’s tradewinds, which move south and east (southeasterly) in the northern hemisphere (from 30˚N to 0˚) and northeasterly in the southern hemisphere (from 30˚S to 0˚). As these tradewinds near the equator, they travel across the ocean and absorb massive amounts of water (due to the increased water holding capacity of the warmer air mass). The tradewinds slam into western Africa, western South America, southern India, northern Australia and the South Pacific producing the world’s lush tropical forests. As the high pressure air mass descends at 30˚ and splits, half of the air mass travels along surface of the Earth towards the poles in the Ferrell cell. Just as the Hadley cell, the air masses will move toward the right in the northern hemisphere and to the left in the southern hemisphere, relative to the rotation of the Earth. However, unlike the Hadley cell, the surface winds of the Ferrell cell move in a westerly direction. As the air mass moves toward the poles at 30˚, the initial speed of the air mass is faster relative to the rotational speed of the Earth further poleward (due to the shrinking circumference of the Earth). This causes air masses (known as westerlies) travelling from 30˚ to 60˚ to move from south to west (southwesterly) in the northern hemisphere and northwesterly in the southern hemisphere. As the polar convection reaches the the poles (90˚) the cold, dry air mass descends to the surface of Earth generating an area of high pressure, which moves along the surface towards the low pressure area at 60˚. As this air mass moves along the surface, it travels clockwise, due to the Coriolis effect of the counter-clockwise rotation of the Earth. This effect causes polar wind to travel along the surface of the Earth from 90˚ to 60˚ southeasterly in the northern hemisphere, and northeasterly in the southern hemisphere. When the polar wind at the surface of the Earth reaches 60˚, it combines with the warming air mass of the Ferrell cell and rises, completing the Polar cell. Relative to its (annual) orbital axis around the sun, the (daily) rotational axis of Earth is tilted 23.5˚. This is known as Earth’s axial tilt. As the earth orbits the sun throughout the year, its axial tilt affects regional temperature patterns generating seasonality. Due to Earth’s axial tilt, the equator of Earth is not always directly perpendicular (90˚) to the solar radiation angle of incidence. On Jun 21st, day length is at its maximum in the northern hemisphere and at its minimum in the southern hemisphere (and is known Northern Summer Solstice and the Southern Winter Solstice). On this day, the solar radiation angle of incidence is perpendicular (90˚) to the latitude 23.5˚N. Thus on the Northern Summer Solstice, areas surrounding 23.5˚N latitude receive the most direct amount of solar radiation than any where else on the planet, responsible for northern summers and southern winters. The latitude of Earth that receives a perpendicular solar radiation angle of incidence (and therefore the most solar radiation) is known as the solar equator. Figure 8. Earth's axial tilt generates seasonality. As Earth rotates around the sun, the position of the solar equator changes. As Earth orbits from the Northern Summer Solstice the solar equator moves southward. On September 21st, the solar equator and Earth’s equator align, on a day known as the Northern Autumnal Equinox and the Southern Vernal Equinox. On this day, day length in the northern and southern hemispheres are equal with night length. Figure 9. Northern winter solstice and southern summer solstice. As Earth moves beyond the Northern Autumnal Equinox, the constancy of Earth’s axial tilt causes the south pole to move closer to the sun, while the north pole moves further away. Days in the north become shorter while days in the south become longer. Likewise, the solar equator begins to move south. On Dec. 21st (the Northern Winter Solstice and the Southern Summer Solstice), the solar equator reaches latitude 23.5˚S. On this day, day length is minimized in the northern hemisphere and maximized in the southern hemisphere. As Earth moves beyond the Northern Winter Solstice the solar equator move back towards Earth’s equator, and days become longer in the north and shorter in the south. On March 21st (the Northern Vernal Equinox and the Southern Autumnal Equinox), day length is equal to night length in both hemispheres. Figure 10. Variation in solar radiation due to Earth's axial tile. Figure 11. Variation in precipitation due to Earth axial tilt. Precipitation is caused by two forces: (1) increasing water vapor and (2) decreasing air temperatures to its dew point. Increasing water vapor happens in a variety of ways. The dominant source of atmospheric water vapor is evaporation. As a warm air mass moves across a cooler body of water, liquid water evaporates into gaseous water increasing the air mass’s humidity, or the amount of water in an air mass. Secondly, when plants absorb water from their roots, the water is carried through their vascular system and is released to the atmosphere through small pores in their leaves, a process known as transpiration. Figure 12. Condensation and precipitation via adiabatic cooling. As air masses cool, water vapor condenses to liquid water, forming clouds. Eventually, this water falls back to Earth as precipitation (as rain, snow, or ice), when the atmosphere becomes saturated with water vapor. Dew point is the temperature at which water vapor condenses into liquid water at the same rate it evaporates. At temperatures below the dew point, water in the atmosphere condenses and precipitates; while at temperatures above the dew point, atmospheric liquid water vaporizes into gaseous water. One mechanism of producing condensation by reducing the air mass to its dew point is known as adiabatic cooling. As air masses rise, air pressure and temperature decrease, and the relative humidity increases. Once this air mass reaches the dew point, water vapor condenses forming liquid water droplets we see as clouds. This process is initiated at condensation nuclei, where condensing water collides with dust or ice crystals. As more condensation occurs, developing water molecules attach to other condensation nuclei or existent water droplets (or ice crystals). Alternatively, condensation can occur when a wet warm air mass encounters a cooler air mass, a process known as conductive cooling. As the warmer air mass collides with a cooler air mass, its temperature declines to its dew point causing condensation. Figure 11. The rain shadow effect creates some of the world’s driest deserts. Though water is denser than air, air currents keep water and ice aloft until they reach a mass no longer capable of keeping them sustained in air. At this point, the water droplets (or ice crystals) fall to the surface of Earth as precipitation. Adiabatic cooling by rising air masses occurs in one of two ways: upward convection (Fig. 10) or movement up a physical barrier. The global scale atmospheric convections cells (Hadley, Ferrell, and Polar) cause air masses to rise, generating precipitation due to adiabatic cooling. As an air mass reaches the continent from an ocean (or other large body of water), the air mass is forced upward, in a process known as orographic lift. If the rise of continent is great enough, the air mass will lose all (or nearly all) of its moisture as precipitation on the windward side of the mountain chain. As the air passes over the mountain chain, it is stripped of its moisture creating very dry conditions on the leeward side of the mountain. This process is known as the rain shadow effect, and is responsible for creating some of the world’s driest deserts. Chile’s Atacama Desert is the driest desert in the world due to a double rain shadow effect from two very tall mountain chain (some rain stations have never received measurable precipitation). The Sahara Desert is actually made much drier due the the presence of two rain shadow effects, as well. Rain shadow deserts in N. American include the Mohave, Great Basin, Sonoran and Chihuahuan deserts.